The ESP32 integrates two 12-bit SAR (Successive Approximation Register) ADCs supporting a total of 18 measurement channels (analog enabled pins). ADC2 is used by the Wi-Fi driver. Therefore the application can only use ADC2 when the Wi-Fi driver has not started. ESP32 DevKitC: GPIO 0 cannot be used due to external auto program circuits. ESP-WROVER-KIT: GPIO 0, 2, 4 and 15 cannot be used due to external connections for different purposes. The ADC should be configured before reading is taken. For ADC1, configure desired precision and attenuation by calling functions adc1_config_width() and adc1_config_channel_atten(). For ADC2, configure the attenuation by adc2_config_channel_atten(). The reading width of ADC2 is configured every time you take the reading. Attenuation configuration is done per channel, see adc1_channel_t and adc2_channel_t, set as a parameter of above functions. Then it is possible to read ADC conversion result with adc1_get_raw() and adc2_get_raw(). Reading width of ADC2 should be set as a parameter of adc2_get_raw() instead of in the configuration functions. Since the ADC2 is shared with the WIFI module, which has higher priority, reading operation of adc2_get_raw() will fail between esp_wifi_start() and esp_wifi_stop(). Use the return code to see whether the reading is successful. It is also possible to read the internal hall effect sensor via ADC1 by calling dedicated function hall_sensor_read(). Note that even the hall sensor is internal to ESP32, reading from it uses channels 0 and 3 of ADC1 (GPIO 36 and 39). Do not connect anything else to these pins and do not change their configuration. Otherwise it may affect the measurement of low value signal from the sensor. This API provides convenient way to configure ADC1 for reading from ULP. To do so, call function adc1_ulp_enable() and then set precision and attenuation as discussed above. There is another specific function adc2_vref_to_gpio() used to route internal reference voltage to a GPIO pin. It comes handy to calibrate ADC reading and this is discussed in section Minimizing Noise. The value read in both these examples is 12 bits wide (range 0-4095). The ESP32 ADC can be sensitive to noise leading to large discrepancies in ADC readings. To minimize noise, users may connect a 0.1uF capacitor to the ADC input pad in use. Multisampling may also be used to further mitigate the effects of noise. 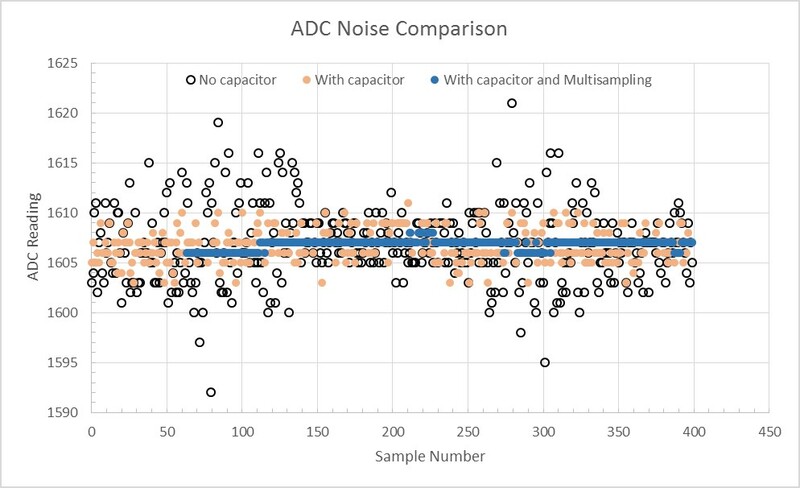 Graph illustrating noise mitigation using capacitor and multisampling of 64 samples. The esp_adc_cal/include/esp_adc_cal.h API provides functions to correct for differences in measured voltages caused by variation of ADC reference voltages (Vref) between chips. Per design the ADC reference voltage is 1100mV, however the true reference voltage can range from 1000mV to 1200mV amongst different ESP32s. Graph illustrating effect of differing reference voltages on the ADC voltage curve. Correcting ADC readings using this API involves characterizing one of the ADCs at a given attenuation to obtain a characteristics curve (ADC-Voltage curve) that takes into account the difference in ADC reference voltage. The characteristics curve is in the form of y = coeff_a * x + coeff_b and is used to convert ADC readings to voltages in mV. Calculation of the characteristics curve is based on calibration values which can be stored in eFuse or provided by the user. Calibration values are used to generate characteristic curves that account for the unique ADC reference voltage of a particular ESP32. There are currently three sources of calibration values. The availability of these calibration values will depend on the type and production date of the ESP32 chip/module. Two Point values represent each of the ADCs’ readings at 150mV and 850mV. To obtain more accurate calibration results these values should be measured by user and burned into eFuse BLOCK3. eFuse Vref represents the true ADC reference voltage. This value is measured and burned into eFuse BLOCK0 during factory calibration. Default Vref is an estimate of the ADC reference voltage provided by the user as a parameter during characterization. If Two Point or eFuse Vref values are unavailable, Default Vref will be used. Individual measurement and burning of the eFuse Vref has been applied to ESP32-D0WD and ESP32-D0WDQ6 chips produced on/after the 1st week of 2018. Such chips may be recognized by date codes on/later than 012018 (see Line 4 on figure below). If you would like to purchase chips or modules with calibration, double check with distributor or Espressif directly. Replace /dev/ttyUSB0 with ESP32 board’s port name. There are macros available to specify the GPIO number of a ADC channel, or vice versa. e.g. ADC1_GPIO32_CHANNEL is the ADC1 channel number of GPIO 32 (ADC1 channel 4). Get the gpio number of a specific ADC1 channel. Configure ADC1 capture width, meanwhile enable output invert for ADC1. The configuration is for all channels of ADC1. width_bit: Bit capture width for ADC unit. Set the attenuation of a particular channel on ADC1, and configure its associated GPIO pin mux. The default ADC full-scale voltage is 1.1V. To read higher voltages (up to the pin maximum voltage, usually 3.3V) requires setting >0dB signal attenuation for that ADC channel. For any given channel, this function must be called before the first time adc1_get_raw() is called for that channel. This function can be called multiple times to configure multiple ADC channels simultaneously. adc1_get_raw() can then be called for any configured channel. At 11dB attenuation the maximum voltage is limited by VDD_A, not the full scale voltage. For maximum accuracy, use the ADC calibration APIs and measure voltages within these recommended ranges. Take an ADC1 reading from a single channel. When the power switch of SARADC1, SARADC2, HALL sensor and AMP sensor is turned on, the input of GPIO36 and GPIO39 will be pulled down for about 80ns. When enabling power for any of these peripherals, ignore input from GPIO36 and GPIO39. Please refer to section 3.11 of ‘ECO_and_Workarounds_for_Bugs_in_ESP32’ for the description of this issue. Call adc1_config_width() before the first time this function is called. For any given channel, adc1_config_channel_atten(channel) must be called before the first time this function is called. Configuring a new channel does not prevent a previously configured channel from being read. Power off SAR ADC This function will force power down for ADC. src: I2S DMA data source, I2S DMA can get data from digital signals or from ADC. Configure ADC1 to be usable by the ULP. This function reconfigures ADC1 to be controlled by the ULP. Effect of this function can be reverted using adc1_get_raw function. Note that adc1_config_channel_atten, adc1_config_width functions need to be called to configure ADC1 channels, before ADC1 is used by the ULP. The Hall Sensor uses channels 0 and 3 of ADC1. Do not configure these channels for use as ADC channels. The ADC1 module must be enabled by calling adc1_config_width() before calling hall_sensor_read(). ADC1 should be configured for 12 bit readings, as the hall sensor readings are low values and do not cover the full range of the ADC. Get the gpio number of a specific ADC2 channel. Configure the ADC2 channel, including setting attenuation. This function also configures the input GPIO pin mux to connect it to the ADC2 channel. It must be called before calling adc2_get_raw() for this channel. Take an ADC2 reading on a single channel. For a given channel, adc2_config_channel_atten() must be called before the first time this function is called. If Wi-Fi is started via esp_wifi_start(), this function will always fail with ESP_ERR_TIMEOUT. raw_out: the variable to hold the output data. Output ADC2 reference voltage to gpio 25 or 26 or 27. This function utilizes the testing mux exclusive to ADC 2 to route the reference voltage one of ADC2’s channels. Supported gpios are gpios 25, 26, and 27. This refernce voltage can be manually read from the pin and used in the esp_adc_cal component. Checks if ADC calibration values are burned into eFuse. Characterize an ADC at a particular attenuation. This function will characterize the ADC at a particular attenuation and generate the ADC-Voltage curve in the form of [y = coeff_a * x + coeff_b]. Characterization can be based on Two Point values, eFuse Vref, or default Vref and the calibration values will be prioritized in that order. Two Point values and eFuse Vref can be enabled/disabled using menuconfig. Convert an ADC reading to voltage in mV. This function converts an ADC reading to a voltage in mV based on the ADC’s characteristics. Reads an ADC and converts the reading to a voltage in mV. This function reads an ADC then converts the raw reading to a voltage in mV based on the characteristics provided. The ADC that is read is also determined by the characteristics. Structure storing characteristics of an ADC. Type of calibration value used in characterization.